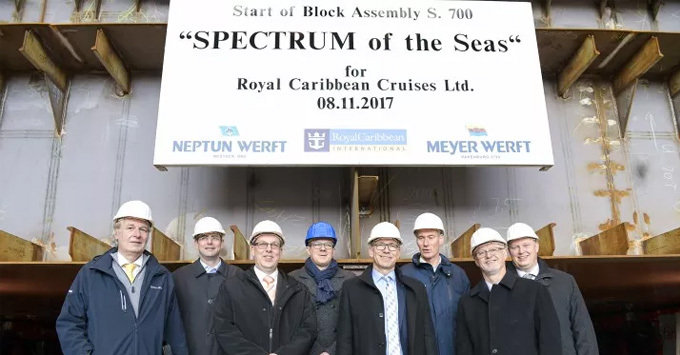 (10:12 a.m. EST) -- Construction is well underway on Royal Caribbean's first Quantum Ultra-class ship, Spectrum of the Seas, with the first block of the new ship lowered into position during a keel laying ceremony at the Neptun Werft shipyard in Rostock-Warnemunde in Germany. The 938-ton block is one of a total of 74 that will make up the cruise ship; two representatives for Royal Caribbean International placed the lucky penny under the block before it was lowered into position. Though the keel laying is often referred to as the "official" start of construction, actual construction began in August when the first steel pieces of the ship were cut to size in the Meyer Werft Laser Center. The 4,200-passenger ship is scheduled for launch in spring 2019. Despite being a Quantum Ultra-class ship, Spectrum of the Seas is only a tiny bit larger than its Quantum-class shipmates, measuring 168,800 gross tons versus 168,666 gross tons for both Anthem and Ovation of the Seas (Quantum of the Seas is smaller). All carry the same number of passengers.